Elisabetta Casalone from the University of Turin in Italy presents the abstract developed by her team at iMig 2018 in Ottawa, Canada. One of the complicating factors for many mesothelioma patients is that this rare and life-threatening form of cancer is difficult to diagnose. This can leave mesothelioma undetected until it has progressed to a later stage, when it is harder to treat. The symptoms of pleural mesothelioma overlap with other, more common illnesses, including lung cancer and pneumonia. To combat this problem, researchers in Italy are studying samples from pleural mesothelioma patients to develop a set of mesothelioma biomarkers that can be used for early diagnosis. 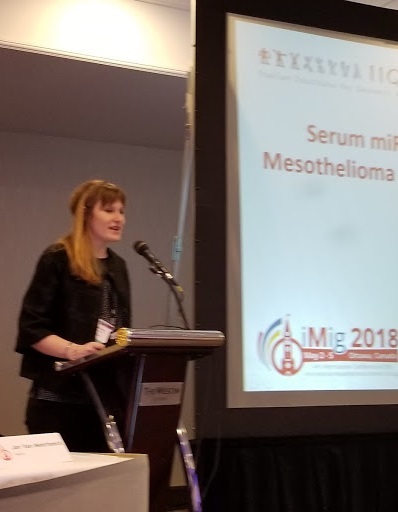 The study on mesothelioma biomarkers is only one of dozens of pieces of mesothelioma research presented at the biennial conference of the International Mesothelioma Interest Group (iMig) this year in Ottawa, Canada. Mesothelioma Circle is highlighting studies that received the Young Investigators Awards at this year’s conference, including this attempt to identify mesothelioma biomarkers. A large team of Italian researchers, led by Elisabetta Casalone of the University of Turin, has given themselves a challenge: review serum samples from people who have been exposed to asbestos and see if there’s a difference between those who have developed pleural mesothelioma and those who are cancer-free. If they can find and verify a set of mesothelioma biomarkers that are different from biomarkers found in people without cancer, the scientists will use this as a basis for an early test for pleural mesothelioma. Italy has an unfortunate relationship with mesothelioma. The country was home to the largest asbestos mine in Europe, the Balangero mine near Turin. Italy records over one thousand mesothelioma diagnoses every year, even though the country’s population is less than 60 million. The US sees about three times as many new mesothelioma cases per year, but our population is more than five times as large. The chrysotile form of this deadly mineral that was produced at the Balangero site has proven particularly toxic to humans. Researchers have found that miners at the site experienced a significant rate of mesothelioma and other asbestos-caused cancers. Italy banned asbestos in the early 1990s, but, for the people who live near and worked in the asbestos mines, the danger is not over. The Italian research team used massive parallel sequencing (MPS), a technique to efficiently sequence the microRNA(miRNA) from 30 pleural mesothelioma patients and 30 healthy participants. MiRNA is a type of RNA that doesn’t create proteins (as many RNA molecules do) but is used to regulate the expression of certain genes. This can include silencing (shutting genes down) or activation. These tiny bits of RNA could hold a key to turning on or off genes that clear the way for cancer cells to grow unchecked. The search for mesothelioma biomarkers is part of a larger trend in cancer research to find the molecular and cellular characteristics that cause one person to develop cancer while another, with the same environmental exposure, does not. The team discovered a difference in two places: miRNA -126 was downregulated (the serum contained less of this RNA than normal) and miRNA-197 was upregulated (found in larger than expected amounts) in patients with pleural mesothelioma. This promising research is just beginning. The team from Italy plans to study samples from the European Prospective Investigation into Cancer and Nutrition (EPIC). EPIC is a long-term study that started in 1992 and includes more than half a million participants. The study has collected serum samples, which the Italian researchers will sequence to determine if their initial assumptions about mesothelioma biomarkers hold true in a larger sample. As any mesothelioma patient knows, pleural mesothelioma is not an easy disease to diagnose. Your doctor must first rule out more common and likely causes for symptoms such as a persistent cough, pleural effusion (fluid buildup), shortness of breath, unusual tiredness, or a low fever. Mesothelioma may be misdiagnosed at first. Sometimes it’s only after treatment for another illness fails that doctors investigate further and discover mesothelioma. If you know you worked or lived around asbestos dust, you and your doctor can both be vigilant for signs of mesothelioma. But many people who were exposed to toxic asbestos aren’t aware of it since employers didn’t warn their employees or provide proper protection. Your exposure might have happened decades ago, and it may be hard to even remember the kinds of products you handled at a work site in your distant past. An early step in diagnosis is to draw a serum sample from the fluid buildup caused by mesothelioma. This can also relieve the pressure of the excess fluid in the lining around your lungs. There are rarely enough cancer cells in this fluid to determine if you have pleural mesothelioma. In most cases, your doctor will have to perform a more invasive excisional biopsy. This takes a tissue sample from your tumor, which is then examined by a pathologist, to get a definitive mesothelioma diagnosis. If the Italian research team is able to find a set of mesothelioma biomarkers, your doctor could run a test on a simple serum sample. This test will be less expensive and less invasive than a biopsy. If the test has a high rate of accuracy, it might eliminate the need to perform an invasive biopsy to get a mesothelioma diagnosis. The more scientists learn about mesothelioma biomarkers, the closer we get to a system of early detection. This would be particularly useful in Italy, with its high rate of asbestos exposure and resulting mesothelioma cases. Imagine a world where every person with a history of asbestos exposure could take a simple annual test to check for mesothelioma. The test might uncover the disease at the very earliest stages, even before symptoms have developed. As with all forms of cancer, early detection allows for a broader range of mesothelioma treatment options and better outcomes from treatment. Even if mesothelioma biomarkers and early detection don’t lead to a mesothelioma cure, they could significantly increase the survival time for mesothelioma patients. A biomarker generally refers to a measurable indicator of some biological state or condition. The search for mesothelioma biomarkers was one of several promising studies singled out for a Young Investigator Award at the 14th International Conference of iMig 2018. Kazan Law, which sponsors the Mesothelioma Circle website, also provides sponsorship for these awards. Mesothelioma usually shows up in the later years of life because this cancer takes so long to develop. But young researchers who are just beginning their scientific careers can make significant contributions to our understanding of this life-threatening cancer. The Young Investigator Awards recognize this new generation of creative scientists who are working toward better outcomes for mesothelioma patients.